The toque monkey, a member of the macaque family, lives only in Sri Lanka and is widely distributed. There are three subspecies with only small differences in appearance. These monkeys are medium sized and sturdily built. They have stout rather short limbs and long tails. Fully grown adult males can grow up to about 50 centimeters (20 inches), while females are smaller. Toque monkeys vary in color. Usually monkeys' backs are a dusky reddish brown, as are the outer limbs. The front of the body is lighter in color. The toque macaques of Sri Lanka eat a varied diet, including fruits, seeds, flowers, berries, shoots and small animals like crickets, spiders and sometimes even eggs. Using both hands, they cram their food into their mouths until their cheek pouches are full. They can chew their food later. 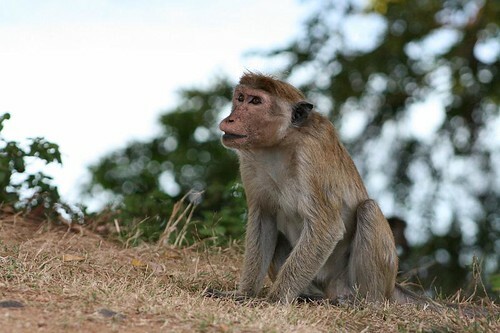 Wild Sri Lankan macaques live in troops. A troop can number up to about 20 members, of both sexes and all ages and sizes. A troop has its own territory and a large fully grown male leads and protects the troop. He has power over his entire harem and the other males.